A minority government or coalition of all parties other than the Conservatives would represent around the same percentage of the electorate – at over 60%, that a Liberal-Conservative one would at 59.1%. The Conservatives got just 36.1% of the vote, merely the largest minority, so they have no unique right to form a government. First past the post results in the votes of millions being binned unrepresented if they don't vote for the party that got the majority (or more often the largest minority) of the votes in that constituency. It also distorts how people vote as a result by encouraging them to vote for a party they see as bad in order to keep out one they see as worse. It results in 'safe' seats which result in big parties looking after the interests of big donors to party funds rather than those of voters. P.R on the single transferrable vote or the additional member systems systems (the latter being the one used in Scottish Parliament elections) would allow people to vote positively for the candidate or party they agreed with most and would ensure that everyone's vote counted equally and was represented. We need to scrap the backwards, undemocratic and archaic first past the post system now - and replace it with PR (STV) or PR (AMS). A coalition or minority government of all parties except the Tories might well be unstable and find it difficult to agree on anything except a bill on PR and not making big public spending cuts until the economy recovers, but those two issues would be plenty – and they would disagree on them far less than Liberals and Conservatives would be likely to. Labour, with less seats, are also more likely to offer a solid pledge on a referendum on P.R than the Conservatives are. Brown may need to pledge to step down as Labour leader within the next few months to get that deal. By doing so he would be remembered as a Prime Minister who put democracy and the good of both his party and the country before his own career. He might well even be made a Minister in the new government. Clegg only needs a coalition or minority government which includes a pledge on a referendum on PR within months. It doesn’t need to survive long to do that – and then the next election would be under P.R. - with very different results, whether thye next election is months or years away. 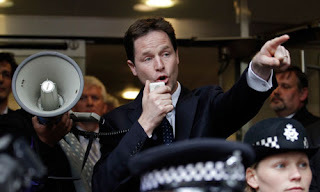 If Clegg accepted a deal that does not deliver full PR (which excludes the 'Alternative Vote'), whether from the Conservatives or Labour, his party will split and most Lib Dem voters will abandon his party entirely. Even if propping up the Conservatives or Labour lost the Lib Dems half the votes they got in the last election at the next one, they would still increase their number of seats under PR. Currently they have under 10% of the seats in parliament (57 seats) from 23% of the vote. Even if their vote halved in a future PR election (and it would be unlikely to as under PR more people would feel they could vote Lib Dem without letting Labour or the Conservatives in) they would get 12.5% of the seats, or 81 seats - a big increase. Supporting any government without pledges on PR and delaying spending cuts would put the Lib Dems in the same position they were in in the Scottish Parliament in the past - as the junior partner in a coalition with little influence on most of government policy, but being held responsible for all government policy by the voters - and losing seats in future as a result. Well - in complete contradiction to my own guesses before the election Labour increased it's majority in my constituency due to fear of a Conservative government (full result here) After spending a week organising my campaign, election communication and website and three weeks knocking on doors and ringing doorbells I got well and truly gubbed with 670 votes, 1.4% of the total number cast. It is a 48% increase on my vote last time but still irrelevant to the result as a whole. I can’t blame people here for being scared of a Conservative government and voting Labour out of fear of it as bad rather than much worse. 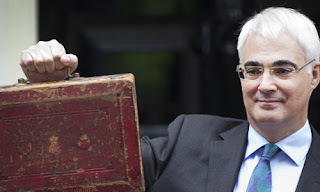 On top of that the Conservatives (pretty much the UK equivalent of the Republicans) have won the largest number of seats in parliament - and whether they or Labour win they've both said they'll make cuts in public spending bigger than Thatcher did - as Labour Chancellor Alastair Darling said before the election. They won't touch military spending, or private finance initiatives, or public subsidies to arms firms, or public subsidies to privatised rail firms - nor raise taxes on the highest earners, nor close down tax havens. So that means lots of public sector workers sacked (the local councils have already started by sacking the lollipop ladies and men (road safety wardens) for road crossings at primary schools. More people made unemployed would mean reduced demand in the economy, which will result in knock on job losses in the private sector. This would likely lead to a "double dip recession" like the one Japan suffered in the 1990s, with the job losses killing the recovery of the economy. All in all it looks pretty grim unless the big parties’ leaders step back from the brink or the smaller parties and some back-bench Labour MPs on the left of the party can prevent it – which I hope they can. We certainly will have to cut public spending and/or increase taxes to avoid the risk of ending up a bit like Greece (though our public spending and debt as percentages of GDP are lower than Greece’s and we can vary the interest rate as we have our own currency, so we’ll hopefully avoid that fate). The question is who to tax and what cuts to make. We can’t afford to make large numbers of public sector employees unemployed any more than we can afford to continue without any cuts our tax rises. The most important thing is not that we eliminate the debt rapidly but that we rebuild an economy that can pay off that debt rather than slash and burn into a vicious circle of rising unemployment. I'm still hopeful that we might get proportional representation for future elections if the Lib Dems stick to their guns on demanding PR in return for any kind of support for a minority government. That would mean that in future elections people could vote for the candidate or party they agree with most instead of mostly voting negatively against the party they dislike most and for one they only see as slightly less bad. Nick Clegg would be a fool to accept David Cameron's vague promises of an all party electoral commission to discuss reform - he needs to hold out for a solid commitment to bring in proportional representation - and would be more likely to get that from Labour, who have less seats and so are more desperate to make a deal - and who at least believe that public services should exist and be well funded, unlike most Conservatives, even if both parties (and the Lib Dems) have gone for the over-charging and service cuts resulting from PFI and PPP deals.